FIWARE technologies are being used to solve critical problems all over the world. Solutions powered by FIWARE are as diverse as cleaning solar panels, allowing deaf people to interact with a sound-based world, maintaining the handling temperature of food, and visualizing real-time weather information. The FIWARE community links more than 1,000 startups in nearly 90 cities. 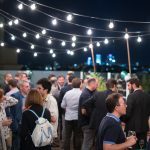 The community gets together twice a year for the FIWARE Tech Summit and the FIWARE Global Summit. FIWARE is trusted by super startups like Carto and Glamping Hub. 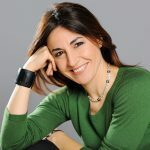 In 2011, the European Commision launched a €300 million initiative, the Future Internet Public Private Partnership (FI-PPP), to “increase and share the social and economic benefits of the future internet for consumers, citizens, businesses and the public sector.” The FI-PPP set to work and subsequently developed FIWARE. FIWARE is a scalable, open-source platform that provides a simple yet powerful set of APIs to ease the development of smart applications. 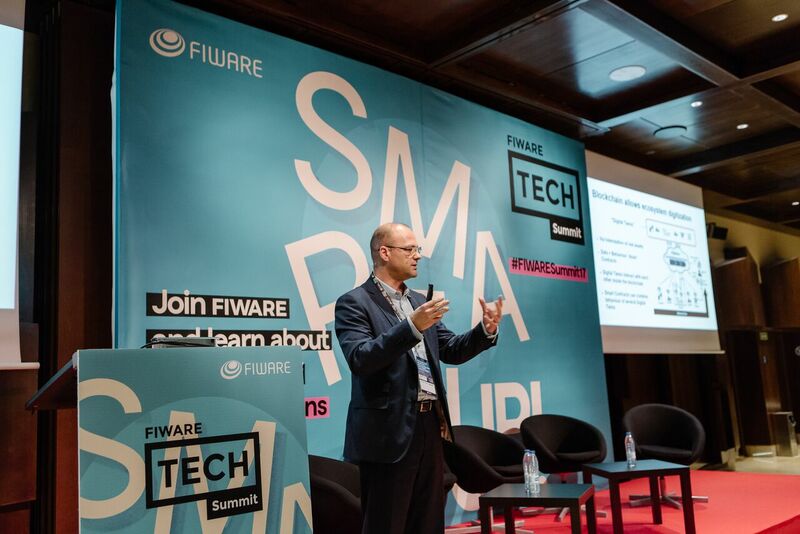 FIWARE’s technologies are royalty-free and available to all–along with support materials, including a Generic Enablers catalog, video tutorials, guides for developers, and more–on the FIWARE website. FIWARE offers a wide range of solutions for startups and other technology-based organizations. Think of it as a toolkit. Any good toolkit contains a wrench, a hammer, several screwdrivers, pliers and so on. You don’t need to use all the tools at once, but you do expect the right tool to be at hand when you encounter something to be fixed. FIWARE works the same way. You can pick and choose which Generic Enablers to incorporate into your technological base depending on what solution you need. Looking for software to enable complex data visualization? Need to retrieve aggregated information from IoT devices? Want a springboard for developing your augmented reality (AR) platform? FIWARE covers all this and more. Currently, FIWARE is solving real problems all over the world. Its Enablers make it especially well-adapted for Smart City solutions. For example, it’s being implemented in Seville, Spain to monitor water quality in public fountains. Another powered-by-FIWARE solution aims to use robots to make life easier for the elderly and other people who may have reduced mobility. This project is a collaboration between eProsima robots and Situm indoor navigation software; they were able to build a bridge between their services using a FIWARE Enabler, thus taking steps toward making robotic assistance a reality. The histories of FIWARE and IMPACT have been intertwined since the beginning of the accelerator program’s existence. 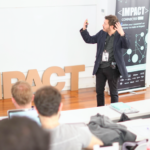 IMPACT Accelerator was created by a consortium of European companies in 2014, when the European Commission awarded the consortium with a €6.4 million fund to be used to accelerate European FIWARE startups. The fund was put towards a variety of FIWARE-promoting activities, including international events and hackathons. Most of it was centralized, however, in the acceleration program, which paired high-quality training with equity-free funding for startups. IMPACT held three open calls for startups over two years. More than 5,000 startups applied from more than 60 countries, representing sectors as diverse as education, e-commerce, and infrastructure and security. All applicants were already using FIWARE or submitted a FIWARE implementation plan. Through our open calls, more than 5,000 startups were therefore actively engaged in the FIWARE community. Many of them liked what they saw, becoming contributors to the open-source repository of code and improving existing enablers. The best 60 startups were selected to participate in the IMPACT Acceleration program. Most of these are still in existence today, and many of them have become FIWARE success cases. Over the course of our history with FIWARE, we saw it grow from an early-stage project into the mature suite of solutions it is today. When we began to prepare our second program, IMPACT Growth, we realized that we could benefit from a deeper relationship with FIWARE. That’s why the FIWARE Foundation entered IMPACT as a consortium partner in IMPACT Growth. This program is focused on four verticals identified by the European Commission as key areas for future investment: Smart Cities, Smart Content, Smart Manufacturing and Smart Agrifood. It’s important to us at IMPACT to align our goals and objectives with European Union policies, and the IMPACT Growth program is making that happen. Soon after the launch of IMPACT Growth, we embarked on yet another program, IMPACT Connected Car. The FIWARE Foundation is also a consortium member in this initiative, which is focused on unifying and strengthening all parts of the connected vehicle value chain. All IMPACT startups, therefore, have access to extensive FIWARE support, and they’re taking advantage of it: IMPACT startups are using the technologies to power amazing things. For example, Insylo is using FIWARE to remotely monitor the stocks of the silos of the livestock farms and optimize the replenishment routes. FIWARE has allowed LeeLuu Stories to create interactive nightlights that track children’s sleep. Measurence has implemented Enablers to detect presence, position and activity of people within physical spaces, thereby creating an actionable data platform for any physical commerce business. The possibilities are endless!